07/01/18'STATION PARK - FORFAR'Peterhead Manager Jim McInally wins the Ladbrokes League 2 Manager of the Month award for January. Peterhead boss Jim McInally has slammed the mentality of fringe players at other clubs who would rather sit and do nothing instead of joining Peterhead and fighting for a title. The Balmoor boss is shocked that young players would not jump at the chance of getting regular football after failing to land anyone in the January window. McInally – the Ladbrokes League Two Manager of the Month for January – is so stretched at the moment he could only name three subs last weekend. But he insists the Blue Toon will battle on regardless in their bid to return to Ladbrokes League One at the first attempt. McInally said: “I tried in vain in the last couple of weeks to get players in. I couldn’t get anyone to come and it’s left us a bit short. “I will continue to try to bring bodies in because I can still do emergency loans. “Last Saturday we only had three subs and two of them were just young boys. “It was a terrible window for us – but it wasn’t for a lack of effort. “When you say ‘Peterhead’ the phone goes down pretty quick. “But if you ask boys like Simon Ferry and David McCracken, once they come to the club and see how friendly it is and how well they are looked after they love it. “The travelling puts a lot of people off. “But it horrifies me that players who are not getting a game – and have no chance of getting a game – still won’t come. “They can see that we’re fighting to win a league and they don’t have that desire to go and play and show their managers that they are wrong. “This is what we are up against. It’s all too prominent among players now. “I spoke about this with my assistant Davie Nicholls and when we were younger we just went on loan so we could play. “When Davie was at Dunfermline they told he could go to Cork City and he jumped at it – even although he didn’t know where Cork was exactly. “Now it’s not like that. Players don’t have that desire. They would rather sit or play a development game now and again. “They obviously seeing going to Peterhead as a backward step instead of looking at it as a chance to get back on the ladder. 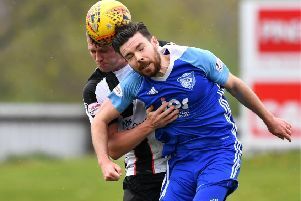 Peterhead, who trial Montrose by four points, travel to Edinburgh City tomorrow and McInally reckons there are four teams in the mix for the title. He added: “I don’t think it is a straight fight between ourselves and Montrose. I think Stenhousemuir and Stirling Albion will play a big part in what happens.